If you’d like to chip in, please send money to dressapp@gmail.com as Friends & Family or make a cash donation day off. This is coming out of my own pocket. Thanks! I took care of the $50 parade fee as well. We will have the room Fri-Sunday. If you’d like to drop your bins off Friday evening, you’re more than welcome too. Space is limited in the room, so please condense your bins after you get dressed as much as possible. Face characters we do have a limited this parade. If you’ve done your character before at this parade, please allow someone else to do the character if they’ve never done it before. You’re welcome to add St Patrick bling to your costumes. Kilts are welcomed as well. Post troop dinner will be posted later. I'm in, reppin' TerpBase as a Kilted Generic Jedi. Hope to procure a kilt by then. If weather allows, I will be there trooping as Ackbar. I learned at the Reston Holiday Parade that the mask and hands are really uncomfortable when it is in the 30s out, so it depends how fast it warms up and whether it rains/snows. The parade likes to go on rain or shine, but I guess it depends on the flooding issues. Right now Saturday looks like its cloudy. We have to muster by 11-11:45am. Because of the walk, we should leave the hotel by around 10:30am by the latest. So depends on how long you need to get dressed and ready to walk to the muster site. Traffic can be a little meh too, but it isn't horrible. Oh forgot to add we are in Division 2 - Celtic! Some of the info in the orginal post seems kinda wonkey. You're right. The date is wrong in the original post- it is tomorrow, 3/2/19, not 3/8/19. The parade actually starts at 12:30 PM, so we should be at the muster location by about 11 AM, which means leaving the hotel changing room at around 10:30 AM to allow time for the walk. Weather-wise, they are not predicting rain but temperatures are supposed to be in the low-mid 40s at muster and parade time, with some wind so it feels colder. 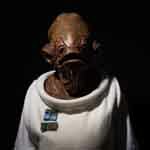 It is right on the borderline of temperatures that are comfortable for wearing the Ackbar mask. It looks like I won't be able to tell until I see the actual conditions tomorrow whether it will be warm enough to march in the costume. If it's tomorrow then I'm out because the Header says 3/3 which is Sun and I have to work in Leesburg on Sat. I'll put Martinni back in the closet. Thank you for the corrected info. Sorry for the incorrect info. I'm not going to make it today - it's borderline temperatures for Ackbar to be comfortable and I just recovered from a nasty cold. Don't want to risk a relapse. I will be at the armor party later, though. Have a great time!